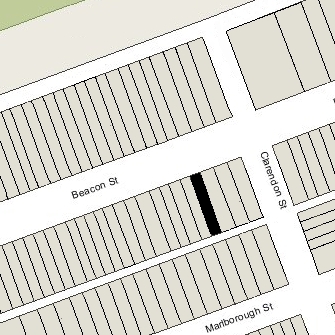 211 Beacon is located on the south side of Beacon, between Clarendon and Dartmouth, with 209 Beacon to the east and 213 Beacon to the west. 211 Beacon was built ca. 1866 for merchant, cotton manufacturer, and real estate developer Charles William Freeland, for speculative sale, one of five contiguous houses (211-213-215-217-219 Beacon) designed as a symmetrical composition, with 211-213 Beacon and 217-219 Beacon having shared porticos and full bays, and 215 Beacon, in the center, having no bay. Originally numbered 199 -207 Beacon, they were renumbered 211-219 Beacon by 1868. Click here for an index to the deeds for 211 Beacon. On November 15, 1867, 211 Beacon was purchased from Charles Freeland by John Whitney Beals. He and his wife, Virginia Arabella (Simmons) Beals, made it their home. They previously had lived at 90 Newton. John Beals was a former woolens merchant. By 1871, he was treasurer of the Mt. Pleasant Coal Co. and agent for the A. T. Stewart Co. of New York, retail dry goods dealers. They continued to live at 211 Beacon during the 1880-1881 winter season, but moved thereafter to Brookline. On September 30, 1880, William B. Kendall foreclosed on a mortgage given by John W. Beals and sold 211 Beacon to William Beals, John Beals’s brother. On November 5, 1880, 211 Beacon was acquired from William Beals by tobacco and cigar dealer Nathan Samuel. He and his wife, Fanny (Salomon) Samuel, made it their home. They previously had lived at the Parker House Hotel and, during the 1878-1879 winter season, at 208 Beacon. 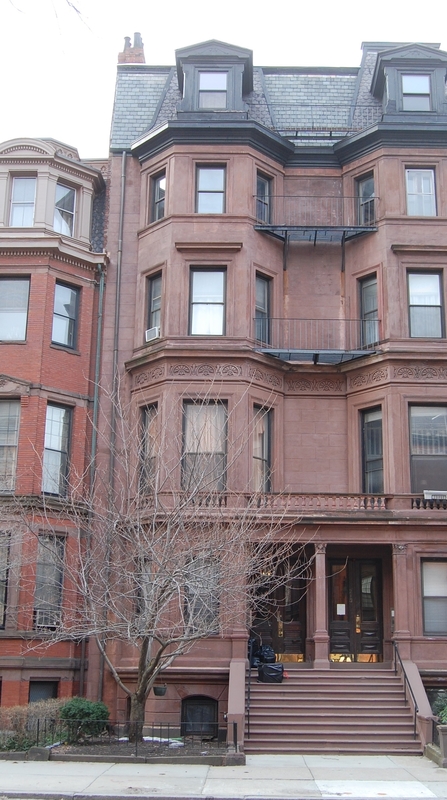 They continued to live at 211 Beacon during the 1883-1884 winter season, but moved thereafter, possibly returning to Germany where they were living by the late 1890s (he was born in Cologne, Germany, and had immigrated to the United States in 1863; Fanny (Salomon) Samuel was born in Hamburg, where they had married in October of 1877). On November 10, 1884, Nathan Samuel transferred 211 Beacon to his wife. She leased the property to others. By the 1884-1885 winter season, 211 Beacon was the home of John T. Ellis and his wife, Elizabeth Ray (Metcalf) Ellis. In 1884, they had lived at 192 Commonwealth. John Ellis was a dealer in tailors’ trimmings. Living with them were their unmarried son, Augustus H. Ellis, a real estate agent, and their daughter, Angeline S. Josselyn, widow of Francis R. Josselyn. Elizabeth Ellis died in January of 1896, and John Ellis died in March of 1903. Augustus Ellis and Angeline Josselyn continued to live at 211 Beacon in 1905, but had moved to 371 Beacon by 1906. On October 2, 1905, 211 Beacon was acquired from Fanny Samuel (living with her husband in Berlin) by Joseph Warren Merrill, Jr. He and his wife, Marian Louise (Raymond) Merrill, made it their home. They previously had lived in Manchester. J. Warren Merrill was a trustee of estates. The Merrills continued to live at 211 Beacon during the 1907-1908 winter season, but moved thereafter to the Hotel Somerset. 211 Beacon was not listed in the 1909 Blue Book. In 1909, 211 Beacon was the home of attorney Charles Benjamin Barnes. Jr., and his wife, Josephine Lea (Low) Barnes. They previously had lived at 15 Marlborough. They also maintained a home in Hingham. In 1910, Hingham was their primary residence, but by 1911 they also maintained a Boston home at 398 Marlborough. 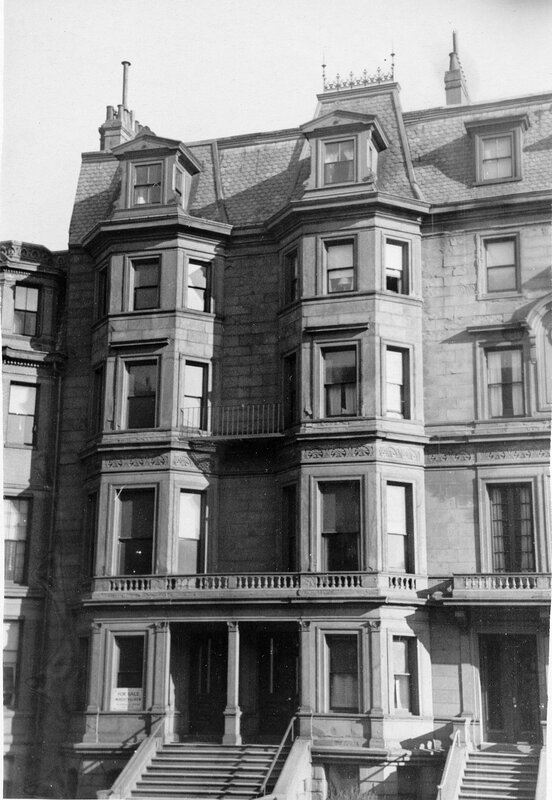 By the 1909-1910 winter season, 211 Beacon was the home of stockbroker Alfred Codman and his wife, Lydia Emmet (Eliot) Codman. They also maintained a home in Nahant. They previously had lived at 406 Marlborough. They continued to live at 211 Beacon during the 1910-1911 season, but moved soon thereafter to West Roxbury. By 1912, they were living at the Hotel Canterbury (southwest corner of Newbury and Charlesgate West) and in West Roxbury. By 1914, they were living at 21 Lime, where they remained until about 1917, when they moved to 51 Hereford. On May 29, 1911, 211 Beacon was purchased from J. Warren Merrill by Elizabeth (Eliza) Whitwell (Thomas) Bradlee, the wife of Frederick Josiah Bradlee. They previously had lived at 4 West Cedar. Frederick Bradlee was a real estate broker and trust company officer. They continued to live at 211 Beacon in 1940, but had moved to an apartment at 274 Beacon by 1941. On July 23, 1941, the Provident Institution for Savings in the Town of Boston foreclosed on a mortgage given by J. Warren Merrill which had been assumed by the Bradlees when they purchased the house. On November 7, 1941, 211 Beacon was acquired from the Provident Institution for Savings by Francis J. Dempsey. 211 Beacon was shown as vacant in the 1941-1944 City Directories and was not listed in the 1942-1944 Lists of Residents. The property changed hands and was acquired on December 7, 1944, by Grace S. (Baxter) Frederick Dawes, the wife of William Mills Dawes, an accountant. She held the property as a trustee. They previously had lived at 325 Beacon. In April of 1945, Grace Dawes applied to remodel the house and convert it from a single-family dwelling to a “guest house.” She subsequently abandoned the application, but in December of 1945, she applied again (and subsequently received approval) to convert the property into a lodging house, having complied with additional egress requirements by installing fire escapes. By 1947, the Daweses had moved to 325 Commonwealth. She continued to own 211 Beacon and operate it as a lodging house. In May of 1948, she acquired 256 Commonwealth, and in November of 1953, she acquired 13 Marlborough. She operated them as lodging houses. On May 1, 1957, 211 Beacon was acquired from Grace B. Dawes by Pollyann Elizabeth (Tillinghast) Frost, the former wife of Burton Willis Frost, Jr., as trustee of the Pollyann Realty Trust. She acquired 256 Commonwealth and 13 Marlborough at the same time, and operated all three as lodging houses. She lived in an apartment at 29 Fairfield and then, from 1961, at 1 Exeter. On February 28, 1962, 211 Beacon was acquired from Pollyann Frost by her brother, Robert Osborne Tillinghast, who operated a men’s dormitory, Osborne Hall, at 278–280 Commonwealth. He also owned 29 Gloucester and 34 Gloucester. By 1962, 211 Beacon had become a dormitory for Burdett College, although its legal use remained as a lodging house. On May 7, 1962, 211 Beacon was acquired from Robert Tillinghast by the First Community Investment Co., Inc. of Lexibgton. On the same day, it also acquired 278-280 Commonwealth, 29 Gloucester, and 34 Gloucester from him. On July 3, 1962, it transferred the properties to Robert J. McHugh, trustee of the Mifro Realty Trust, and on August 13, 1965, he transferred them back to the First Community Investment Co. In October of 1965, it acquired 282 Commonwealth. On June 13, 1966, 211 Beacon was acquired from the First Community Investment Company by Chamberlayne School and Chamberlayne Junior College, located at 128 Commonwealth. It acquired 278-280-282 Commonwealth, 29 Gloucester, and 34 Gloucester at the same time. Chamberlayne continued to operate 211 Beacon as a dormitory. In the mid-1970s, Chamberlayne went bankrupt, and on May 7, 1975, 211 Beacon was purchased by real estate broker and investor Patrick J. Glynn. He continued to operate it as a dormitory. He also owned 213 Beacon and 217 Beacon, and in January of 1978, he acquired 215 Beacon. On January 22, 1991, Patrick Glynn transferred 211 Beacon to himself and his wife, Anne T. (Kelly) Glynn, as trustees of the 211 Beacon Street Trust. In June of 1992, he applied for (and subsequently received) permission to change the occupancy of 211 Beacon from a lodging house to fifteen apartments, indicating that it was an existing condition. 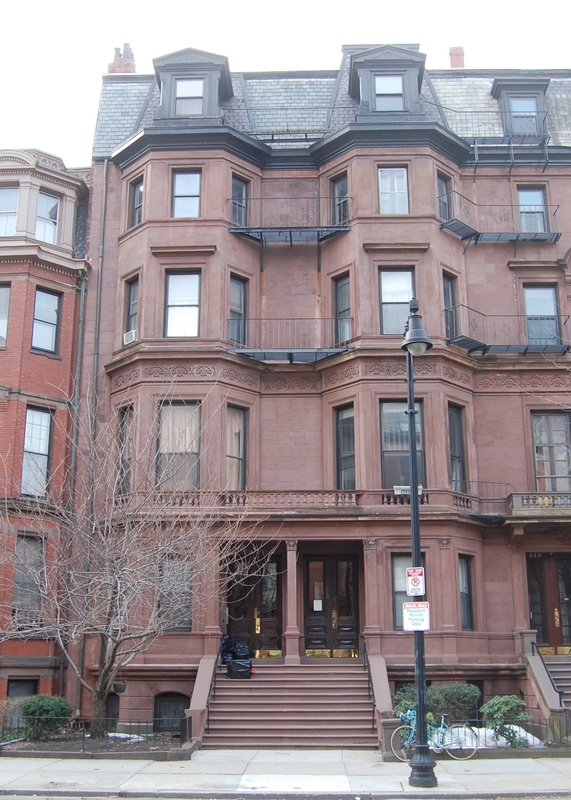 On May 15, 1997, the Glynns transferred the property to the 211 Beacon Street LLP. The property remained an apartment house in 2016.